It's one of the most closely watched House races in the country. Find out where Republican incumbent Rep. Barbara Comstock and Democratic challenger Jennifer Wexton stand on the issues. Editor’s note: This is one in a series of pieces on the Nov. 6 midterm election. WTOP interviewed candidates in key contested local races. See all of WTOP’s coverage election coverage. WASHINGTON — Voters from McLean to Winchester have a decision to make on Nov. 6 in one of the most-closely watched congressional races in the country: re-elect Republican Rep. Barbara Comstock, or replace her with Democratic state Sen. Jennifer Wexton. “I have been a bipartisan leader on the priorities of the region from federal employees … to cutting taxes and supporting our local economy … on national security and the military … and on public safety,” Comstock said. Wexton, though, has attacked Comstock for being one of the members of Congress most frequently voting with President Donald Trump over the last two years. The Trump ticket lost the district in 2016, when Comstock was re-elected. “People in this district do not agree with Donald Trump’s agenda, but Barbara Comstock does,” Wexton said. “Some of the issues that people in the district are concerned about include access to affordable, quality health care, and that’s an area where Barbara Comstock and I have a great deal of contrast. Gun violence prevention is another one, and, also, being a check on this president and some of his more dangerous tendencies. Barbara Comstock has voted with him 98 percent of the time,” Wexton said. Comstock responded in a separate interview that many of the bills she voted on had bipartisan support, and she felt all were good policy for the district, which stretches from the West Virginia line along the Potomac River into parts of Fairfax County. She emphasized her votes to cut regulations for businesses, address opioid issues, deal with veterans care, deport members of gangs, reauthorize the Foreign Intelligence Surveillance Act and extend funding for school security programs. Comstock also worked on a bill requiring sexual harassment training of members and staff on Capitol Hill. “I have a 35-year record of working with our businesses, with our schools, with our philanthropies in this area, and I have those relationships and that has resulted in this ability to cut our taxes, grow our economy,” Comstock said. She has been endorsed by a number of business groups. Wexton, though, said she has her own record to be proud of as a state senator. “I’m a longtime resident of the district. I’m a mom, a former prosecutor and a bipartisan state senator who is determined to go to Washington and get things done for my constituents,” she said. All of Wexton’s bills that have become law have had bipartisan support, since Democrats are in the minority in the General Assembly. “Many of them help kids and families, and that is always one of my most important goals in legislation,” Wexton said. “I think that it’s important that we get back to working across the aisle to get things done in Washington. This is something I’ve been able to do in the General Assembly,” she added. Comstock challenged Wexton’s attacks on Republican policies backed by Trump, including the Republican tax cuts passed last year that Comstock supported. “When you have 4.2 percent growth and you have the economy growing, you want to continue on that path, not resist it,” Comstock said. She promises “tax cuts 2.0” if elected to another term. “These mindless attacks from the resistance left are really destructive to what people want to have done,” Comstock said. To Wexton, a focus on any additional tax cuts, especially for businesses, misses the point. “The national issues are also local issues. People here in the district are concerned about their health care, and the actions of the Trump administration and the Congress that’s been helping him are going to make our premiums here in Virginia go up,” she said. Comstock supports repealing the Affordable Care Act. “I’m my own woman; I stand up and have an independent voice for our area, but it’s also a voice that can work on a bipartisan basis with leadership of both parties, and that’s why, when you look at local/regional issues, we have always had bipartisan leadership on Metro, where I’ve gotten the full funding every year even when Republicans tried to cut it, on the pay increases for our federal employees,” Comstock said. “She’s part of this resistance movement. On Jan. 1, her New Year’s resolution was to resist, and she wants to fight with people. I’m a fighter for my constituents,” Comstock said. Both candidates support additional federal money for Metro, although Wexton would go further to push the federal government to contribute toward the system’s operating expenses. “It’s time that the federal government pony up and pay their fair share. Metro moves the federal workforce,” Wexton said. Comstock has proposed another bill that would extend current special federal capital funding for Metro that is set to expire next fall, but with new restrictions on the agency. 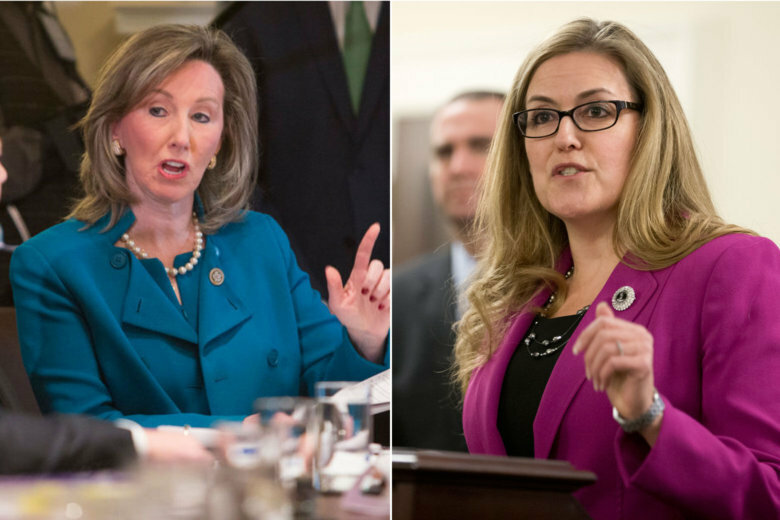 “Barbara Comstock’s [Metro] bill has absolutely no support among any of the Metro jurisdiction members in Congress, and that’s important that all the D.C., Maryland and Virginia groups work together to get a good result,” Wexton said. Comstock, though, is the only Republican currently representing a district with a Metro station. “For decades, this region has had bipartisan leaders. I am the only Republican right now, I’m actually the only woman voting member, in the entire metropolitan Washington region … it’s all men and it’s all Democrats right now, and there was no other leader on the sexual harassment issue in our region. I was the leader. I stood up; I’m on that committee and I took on that task,” Comstock said. Republicans do hold Virginia’s 1st and 7th District seats, which include parts of the farther-out D.C. suburbs. “There’s no other leader in our region who can go to the administration and make sure we are getting our transportation funding,” Comstock said. “Transit and transportation solutions are something that should be bipartisan,” Wexton responded. Comstock emphasized her support for Dulles International Airport and her blocking of efforts by other members of Congress to allow flights to more destinations from Reagan National, which Comstock and other Dulles supporters have said would hurt the regional economy. The National Republican Congressional Committee has also attacked Wexton for toll rates on Interstate 66 inside the Capital Beltway. Wexton opposed the high rates but eventually did support an agreement to widen the eastbound lanes as part of a deal to keep the General Assembly from blocking long-planned tolling rules. For her part, Comstock voted against Virginia’s landmark transportation funding bill, supported by then-Gov. Bob McDonnell, a Republican, in 2013 that provided what local leaders have described as essential statewide and Northern Virginia transportation funding through a mix of tax increases. “I’ve supported increases in transportation funding, whether it’s getting the full funding for Metro, getting TIGER grants for our region, getting regional transportation funding that was increased while I’ve been in Congress, but I’ve done it without raising taxes,” Comstock said. She argued that when the economy is growing, the government can collect more tax revenue at existing rates. Wexton sees the need for action on gun violence as a key issue in the race. “Gun violence prevention is something that has taken on a new life in this campaign in the wake of Parkland and everything that’s been happening in our country,” she said. She has seen new energy from people worried about shootings at schools and elsewhere. “They’re really disgusted that Congress has not been able to do anything or not willing to do anything on this issue in a long time,” Wexton said. She attacked Comstock’s A rating and support from the National Rifle Association. Comstock said her support for the Stop School Violence Act, passed shortly after the Parkland, Florida, school shooting to reauthorize a Department of Justice program meant to stop school threats, fund anonymous reporting systems, school security and training, shows she has taken steps on the issue. The bipartisan bill did not address guns specifically. Comstock also pointed to her support for anti-gang bills meant to add prosecutors and boost other drug and gun enforcement efforts. Each candidate is optimistic about her chances on Nov. 6. “But, as we all know, there’s only one poll that matters and that’s the poll on Election Day,” Wexton said. Both have won races in the district. Wexton believes her focus on health care, gun violence prevention and more is connecting with voters. She has promised to hold town halls regularly throughout the district if she is elected. “Washington hasn’t always been this polarized, and I think the only way we’re going to change the animus in Washington is to change who we send there,” Wexton said.